After round two of Thai Premier League 2012, Muang Thong greets from the top of the table after smashing Thai Port, in Ubon we could see a coach crying in front of fans and the weekends top match between Bangkok Glass and Chonburi resulted in a boring draw without goals. Beside all games and goals of last weekend above one scene has got stuck with us. A crying Esan United coach. Football nowadays has become a business and Royter Moreira stands in duty of his employer. Though it did not stop him, from showing his feelings in front of Siskaet fans. During the match against Osotspa Saraburi they were protesting outside the ground of Tung Burapha Stadium in Ubon Ratchathani. Culminating point of these protests were lighting two straw dolls dressed in an Esan United jersey. After the match Esan coach Royter went to talk to Sisaket supporters and had a brief talk to them. While that, he could not hold his feelings and burst into tears. Already a week ago Siskaet fans tried to call attention invating the pitch at Rajamangala Stadium. Background of it all is the renaming of Sisaket FC in Esan United and the move to Ubon. Of course there was a match to be played as well, and it resulted in a 2-1 for the home side. Thailand's goal machine Sarayuth Chaikamdee has his first goal of the season as he provided the final scoreline of 2-0 for Army United against hosting TOT SC. However, it was no intoxicating match. German Björn Lindemann once more played the full 90 minutes but was left without any assist. Army United now is having four points on account and sitting on same number in table. By the way, no signs of life till now of Estonian goal keeper Kert Kutt. He was not registered with the league. Measured by the felt size of the BEC-Tero Sasana and his standards, the tie against Pattaya United could be considered as a top match. However, above all the first half could not make the grade. The best scene of both sides came by Ittipol Poolsap for Pattaya. Second half was substantially better and for almost the whole second 45 minutes it was the home side dictating the pace. When nearly everything showed towards a goal less draw, Rangsarit Sutthisa hit the net. For BEC-Tero it meant a second consecutive defeat leaving them with nil points at a relegation spot. Although Australian Andrew Ord just received promotion from youth to head coach prior to the season, Tero manager Robert Procureur may could went back into negations with René Desaeyere for the coaching position. 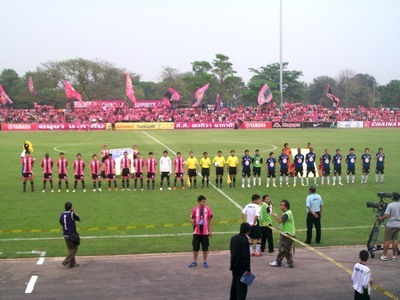 The game between the two promoted teams, Chainat and Wuachon rounds up Saturday. Same as one week before against Army United, Chainat took the lead from a free kick. It did not last long and Wuachon equalized a few minute later right before half time tea to mark the final scoreline. Michael Byrne again came on as substitute during second half for Chainat. He was in full swing and had bad luck when hitting the crossbar. Spaniard José Pedrosa Galán played for 88 minutes. Sunday served us two games who are supposed to be crackers. While Muang Tong welcomed Thai Port, Bangkok Glass were host to Chonburi. The first meeting fulfilled promise, even if only unilaterally. Though one could not say same about second one which on paper was the real top match of the weekend. During the first half the "Rabbits" were the dominant side and had countless good chances with Samuel Ajayi hit the post twice. Ludovick on the parts of the guests still had the best chance after taking a shot from distance. The coming 45 minutes were rather for falling asleep. Even Leesaw could not change it when he was coming on. His purple shoes remained the flashiest on him. Goals en masse could be seen between Muang Thong and Thai Port. New signing Mario Gjurovski provided the half time score with a lovely scoop ball from just outside the box. Leaving the keeper with no chance. 10 minutes played in second half, and Teerasil made it two for the hosts with Pichitphong Choeichiu, couple of minutes later finishing off a quick and perfectly played counter-attack to make it three. Hope for the visitors as Ekkapoom Potharungroj provided the only goal of the night for "Taruea" coming by an own goal. He only recently joined Muang Thong from Thai Port. Hope did not last long though and it was aforementioned Ekkapoom assisting MTU's fourth goal, scored by Sarat Yooyen. Sarat who? The young lad was brought in for Datsakorn Thonglao and surely it raised one or the other eyebrow and left one with questions marks. Taking off such players like Datsakorn and brining in an unknown young lad, in some footballing countries it would called lèse majesté by fans and media. However, at the moment everything seems right on what coach Slaviša Jokanović is doing and it seems he is having a golden hand. Dagno Siaka, with goal number five for the "Kirins" on that night, marked the final point. Shortly before the end, the game had to be interrupted. Thai Port fans fled from away section. We could talked to people involved and we learned that SCG employees, MTU's main sponsor, were the reason for it. These people probably remembered some Port supporters of last year as SCG were still sponsoring Samut Songkhram, and they started to throw some plastic cups. Which of course found its way back immediately. Buriram rested several key players against newly promoted team BBCU. Thus resulting in a slender one goal lead at half-time. Though the guests performed surprisingly well and got several good opportunities to score. With second half Buriram United did several changes bringing in Suchao Nuchnum and Frank Achempong and they were enough help the team winning comfortable by three goals to nothing after 90 minutes. Samut Sonkhram collected the first three points of the season and with four points two games doing unexpectedly well. Former Hearts of Midlothian striker Christian Nade provided the winning goal during injury time against Police United. The tie between TTM and Chaing Rai resulted in a draw without goals. No time for rest, as here we go again with Thai Premier League fixtures on Wednesday. Muang Thong, then will having its third home match in a row and welcomes Bangkok Glass at SCG stadium. Pattaya United is another team to play in front of their own fans for the third time with battered Thai Port. Buriram United and Chonburi are not be in action. The league decided to move both matches to give them enough time for regeneration and preparation on the international duties next week. Funnily both have to play on the coming weekend again in the league. Chonburi for himself, would have played with pleasure and manager Annop complained about and made known that Chonburi has not been asked neither the club asked the TPL to move the fixtures.